While residents in Elmhurst, Queens boast that their neighborhood is one of the most diverse and lively neighborhoods in New York City, for some New Yorkers the community in western Queens barely comes to mind. To make Elmhurst better known, 82nd Street Partnership, a non-profit economic development group in the neighborhood, is working hard to promote the neighborhood’s ethnic businesses. 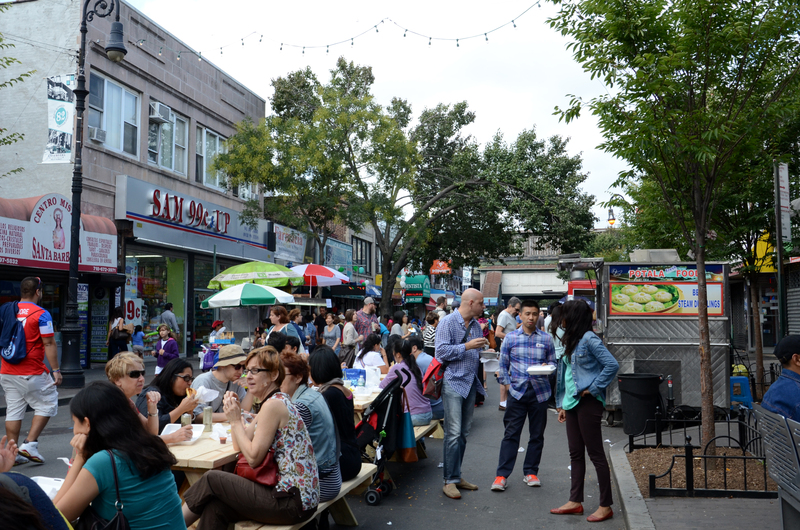 On Saturday Sept. 20, the 82nd Street Partnership held a special food and music festival, the third annual Viva la Comida festival in the neighborhood. Over 50 restaurants and food carts participated, and thousands of people came to taste the food. Foods from Mexico, Colombia, China, India, Korea, Italy, etc. were served on the street, and multiple languages could be heard in the resting areas where people gathered and enjoyed the day. “Foods here are definitely cheaper and yummier and my girls love them too,” said Grace Andrews, who was born and raised in Elmhurst. She has come to the food festival every year since the beginning. This year, she brought her two daughters and invited friends from all over the city. She enjoyed the festival more this year because it was longer from noon untill night and had more sitting areas, she said. Stella Heath and Andrey Patrov came from Brooklyn to enjoy the food. They were attracted by diverse and authentic foods, and especially liked the arepas from the Arepa Lady. 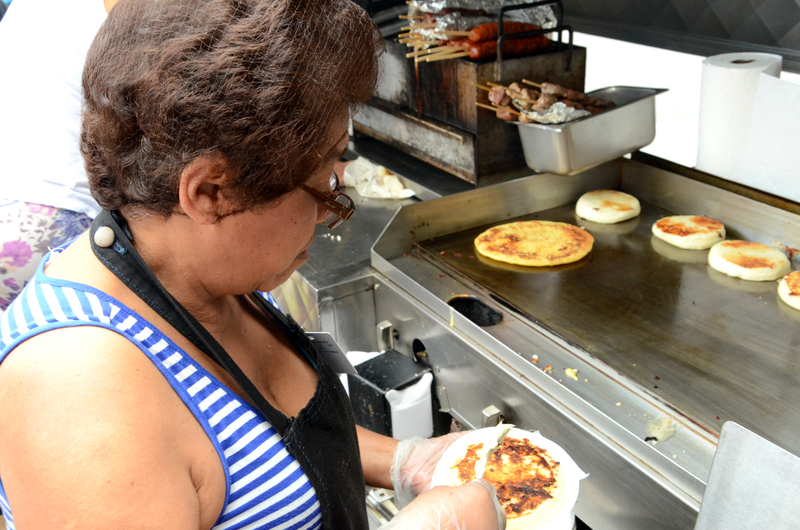 Alejandro Osorio, manager of the Arepa Lady, said his family started the business 20-30 years ago with one food cart. Now they opened a restaurant with the help from the 82nd Street Partnership, as the family gained more customers through the partnership’s marketing and the Viva La Comida festival. Jeff Orlick, one of the founders of the Viva La Comida festival, has lived in the neighborhood for seven yeas and said he loves the culture, energy, and diversity of it. He wanted to promote the street’s small businesses because he saw it as “the future of New York City,” he said. “New York is always changing, and this area has the seeds of change. This place is awesome, and everyone is interesting. This is the destination for people all around the world,” Orlick said. The 82nt Street Partnership has already seen some progresses from their efforts. Local restaurants earn more than 30 percent during the festival than in a typical weekend, and many gain new costumers who keep coming back, according to Davila. “We will continue promoting their businesses, and think about how we can market it because diversity is a huge part of New York, and here is the highlight of the culture in New York City,” she said.